Am I The Last One To Decorate For Fall? 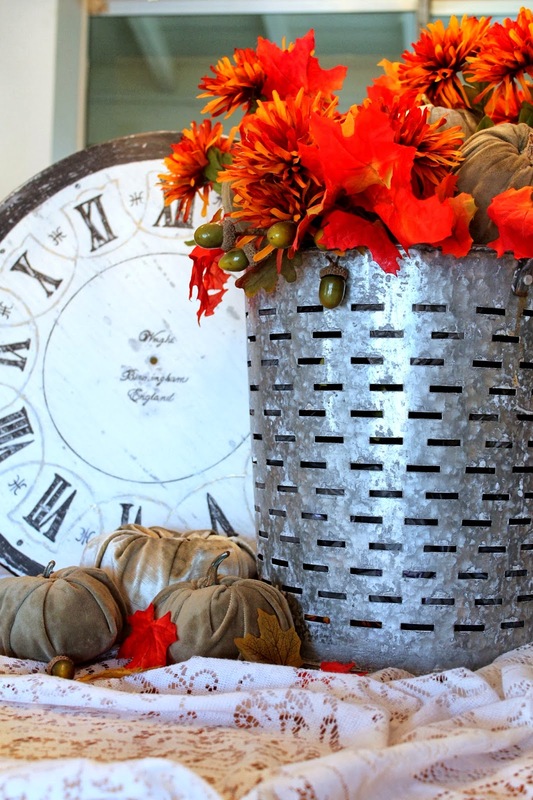 It’s been fun to see all the pretty Fall décor being posted in Blogland. Floridians don’t decorate much for Fall because the season for us doesn’t look much different than any other time of the year. It’s still 90 degrees and the lawn and plants are green year round. Okay, I do miss Fall in Virginia and I am complaining a little bit about not having the pretty Fall foliage and cooler weather. 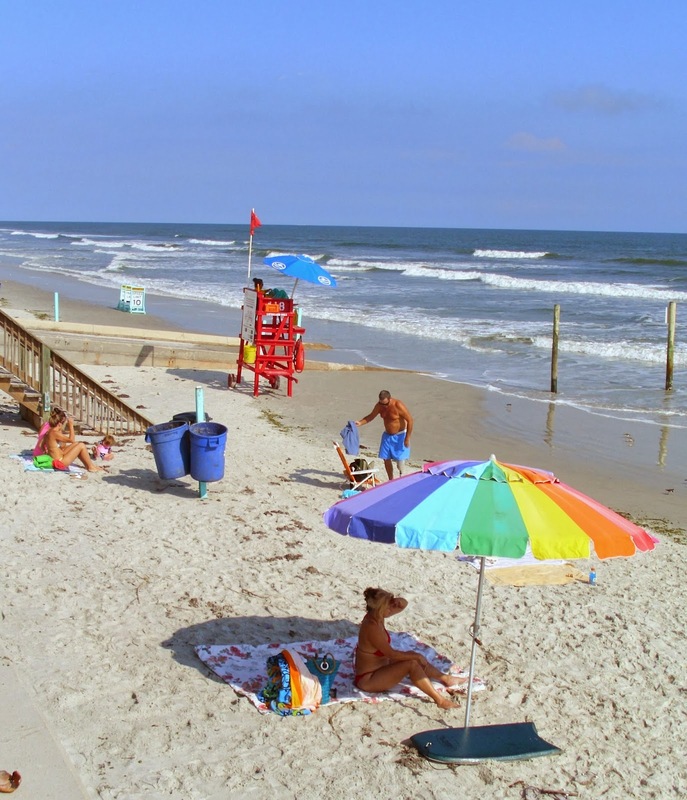 Though, come January when others are sick and tired of snow and cold weather, we will be enjoying walks on the beach, eating al fresco, riding bikes and enjoying the sunshine. I put together a small Fall vignette this year. All of our things are still in storage in Virginia and I think I miss the seasonal décor the most. I used the no-sew velvet pumpkins I made for last years display, added my Farragoz Clock project and The bucket that refused to rust. This is the way Floridians spend the Fall season. 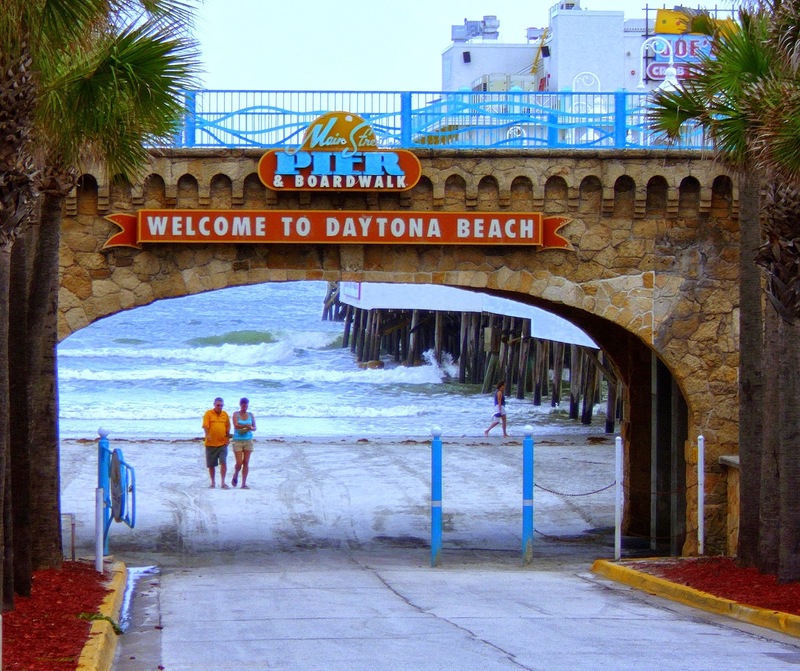 Late afternoon at Daytona Beach last week. the $150 on-line course for $99 HERE. Your fall decor is pretty. Ahhhhhh the beach!!! We are putting on coats and sweaters up here in Chicagoland. Ohhhhhh to smell the ocean and hear the waves. I think I would like that kind of fall!!! I can really relate to this post. It's been a long hot summer/Fall here. I love all the Fall photos and decor, but out west, we put a different spin on it. 88 degrees today. I'm still using sun screen and it's almost November! I'm going to put a bikini on my pumpkin! I love those velvet pumpkins! One year I am going to break down and get some (can't sew). You are a lucky girl…I love winter here in Chicago from about November to February. Then I am SO tired of snow and slush and cold winds! I use to live in Naples, Fl…so I know what you mean about the seasons. It takes an adjustment. Your fall vignette is lovely. I would gladly give up decorating for fall if I could live at the beach!! It's cold here today in Ontario Canada with just a high of 45 degrees – I am looking forward to being in your neck of the woods in March 2014 – it is the higlight of my winter!! Sherry, your Fall decor is lovely. The plush pumpkins are great and I especially love the gray in the color scheme! I live on the coast of California and until yesterday, our days looked much like the beach you showed. Today actually feels like autumn. I know what you mean about the sunny, warm weather affecting your Fall décor. It is hard to fully grasp the change of seasons when you're not having to rake up fallen leaves and wear a sweater. But your décor looks lovely and so appropriate to your area. Next year I might be in the same mood too. I'm curious how living so close to the ocean will affect my decorating. 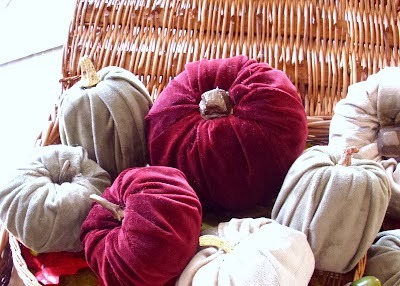 I'm loving your velvet pumpkins, I have a couple of them also, and I just love how soft and pretty they look. I'm a snow bunny, I love the fall and winter season! With two sisters living in central Florida I understand what you mean about fall decorating. One sister never lets the heat stop her though. The seasons change in her decor because she would not be happy without it. I'm visiting after seeing you featured at Must Love Junk and wanted to say hi and that I know the right house will happen for you there. Also, I read that you love Italian pottery and had to visit! I don't have any of those marvelous olive jars you have but I collect old Italian fish majolica, when I find the right prices and I often have as people are more interested in the French fish. Best of luck in adapting to your first year in Florida! P.S. And it will be wonderful there in January! Hi Sherry, I too love living in Florida. I decorate for Fall twice! I decorate for Halloween through October, and then for Fall through November. We live in Southern California where the average temperature is 72 degrees, so it's always hard to tell what season it is, lol. You may be the last one, but I am the one who doesnt do it all! Love your fall decorations especially your plush pumpkins so cute!!! Would love it if you came by and share at One More Time Events..